Do you have a coat that makes you feel like a million bucks? My favorite is actually a new purchase I found at La Mia Moda Boutique. 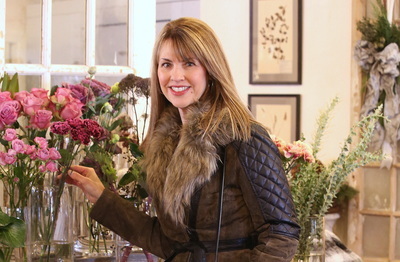 I fell in love with this gorgeous olive suede coat with a fabulous detachable faux fur collar. When I put it on, I feel SO good! It's easy to save our "special" coats for going out, but I wear mine all the time...even with jeans! Why not? Life is short. Here I'm wearing skinny jeans and my high Donald Pliner suede boots--similar HERE and HERE. Not only is the fur collar fabulous, but the black leather trim adds even more detail. I also love that you can get different looks with the collar on and off. Because this is a casual outfit, I'm carrying a very simple cross-body bag from Banana Republic. I really love their bags--they're well made and so reasonable priced! 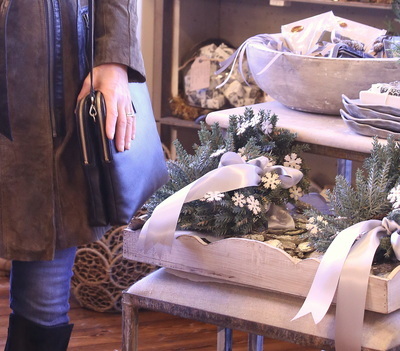 We shot this blog at Les Fleurs in Andover, MA. Their flowers are simply breathtaking. Happy holidays everyone! Hope Santa brings you a fabulous coat! Thank you to Cathleen Trainor for being my best friend and photographer. Thanks so much Darlene! It was a "love at first sight" piece. Looking forward to following you! !